The Village of Skokie gained notoriety in 1934 when, on the night of November 27th, after a gunfight in nearby Barrington that left two FBI agents dead, two accomplices of notorious 25-year-old bank-robber Baby Face Nelson (Lester Gillis) dumped his bullet-riddled body in a ditch along Niles Center Road adjoining the St. Peter Catholic Cemetery. For many years, the population of Skokie was predominantly Jewish. At its peak in the mid-1960s, 58% of the population was Jewish, the largest percentage of any Chicago suburb. It is home to the Illinois Holocaust Museum and Education Center, which opened in northwest Skokie in 2009. The high number of Holocaust survivors living in Skokie during the 1970s factored into a controversy that gained national attention and led to litigation that went all the way to the United States Supreme Court. In 1977, the National Socialist Party of America, a neo-Nazi group, decided to march on Skokie. Given the numerous Holocaust survivors in the community, the village officials feared the march would be disruptive and denied the group permission to hold the march. The NSPA appealed, arguing that the denial violated its First Amendment right to assemble. The case made it to the Supreme Court where the village lost. The Village of Skokie was also involved in a second important case before the Supreme Court that stemmed from a decision by the village regarding land use. Decided in 2001, that case involved Skokie’s decision to use an isolated wetland as a solid waste disposal site. That case also went before the Supreme Court and resulted in an overturn of the federal migratory bird rule, effectively reducing the power of the United States Environmental Protection Agency. Today, the Village of Skokie offers residents the charm, history, and quality of life you would expect from a small town while still being able to enjoy the numerous dining, shopping, and entertainment options available in the City of Chicago just a short car ride away. As you may already know, the creation of an estate plan can be a highly sensitive and very personal undertaking. Working with the right estate planning attorney is crucial to creating a plan that reflects your estate planning needs and objectives. Your choice of an estate planning attorney is one of the most important decisions you will make over the course of your lifetime. The estate planning attorneys at Hedeker Law Ltd. would be honored to be your choice. We look forward to discussing your estate planning needs and helping you get started with a plan that meets those needs, both now and in the years to come. Developing a lasting relationship with our estate planning clients is a priority because the most successful estate plans are those that are continuously reviewed and revised to ensure they meet the creator’s current needs. As your estate planning attorneys, we are in the best position to ensure your plan’s success – but only if we have an ongoing relationship with you that affords us the necessary insight into changes in your life. The initial estate plan you create when you are young and single, for example, will not serve to protect and provide for you once you are married with children. Life events, such as marriage and parenthood, dictate updates to your plan, such as the addition of incapacity planning, creating a trust to protect your minor child’s inheritance, and the inclusion of your spouse and/or children as beneficiaries throughout your estate plan. As your estate grows, you may need to consider asset protection tools within your plan as well as probate and tax avoidance strategies. Looking forward to your retirement years, you will likely want to merge your retirement and estate plans to ensure they work harmoniously together. The high cost of long-term care may also cause you to incorporate Medicaid planning into your estate plan. If you have strong beliefs with regard to end of life medical care and/or the treatment of your body after death, our estate planning attorneys might urge you to execute an advance directive as well as create a funeral planning component within your comprehensive estate plan to ensure that your wishes will be honored. At the estate planning firm of Hedeker Law Ltd. we know it can be difficult to discuss deeply personal, and often sensitive, estate planning issues with a stranger. It is for this reason that we strive to create lifelong relationships with our clients that allow us to help protect you, your assets, and your loved ones both now and in the future. 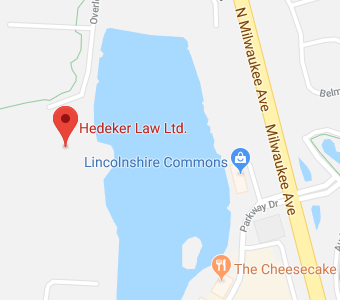 If you have additional questions or concerns regarding estate planning, or if you are ready to get started on your plan, contact the Skokie, Illinois planning attorneys at Hedeker Law Ltd. by calling (847) 913-5415 to schedule your initial consultation.